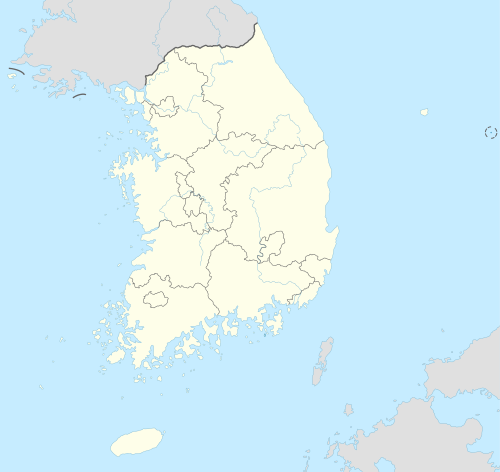 The KBO League (Hangul: KBO 리그), originally called the Korea Baseball Championship (Hangul: 한국야구선수권대회; Romanization: Hanguk Yagu Seonsukkwon Daehoe), is the highest level league of baseball in South Korea. The KBO League was founded with six franchises in 1982, and has expanded to ten franchises. Nine of the ten franchises are named after the companies or business conglomerates which own them, while one sold their naming rights (Woori Heroes in 2008, Nexen Heroes from 2010 to 2018, and Kiwoom Heroes from 2019). The KBO League is the most popular sports league in South Korea. Kia Tigers (formerly Haitai Tigers) are the most successful team, having won 11 out of the 37 championships. The first game was played on March 27, 1982 between Samsung Lions and the MBC Chungyong (now the LG Twins) at Dongdaemun Baseball Stadium, Seoul. Then-president Chun Doo-hwan threw the first pitch. In 1985, the Sammi Superstars became known as the Cheongbo Pintos. The next year, 1986, saw some major changes, with the OB Bears moving from Daejeon to share the Seoul's Jamsil Baseball Stadium with MBC Chungyong in Seoul. A new franchise, the Binggrae Eagles, joined to replace vacancy of Daejeon by OB's moving and expanding the league to seven franchises. 1988 saw the Cheongbo Pintos change ownership again, becoming the Pacific Dolphins. In 1990, MBC Chungyong became the LG Twins and an eighth franchise was added, the Ssangbangwool Raiders who represented the Jeollabuk-do region. There was little change in the 1990s except for a few major sponsors: in 1993 the Binggrae Eagles became the Hanwha Eagles, in 1995 the Pacific Dolphins became the Hyundai Unicorns and the OB Bears in 1999 became the Doosan Bears. Bigger changes were affected in 2000 when the Hyundai Unicorns moved from Incheon to Suwon, and a new franchise, the SK Wyverns took their place in Incheon. The Ssangbangwool Raiders became defunct. In 2001, the Haitai Tigers became the Kia Tigers. In 2008, the Hyundai Unicorns franchise was disbanded, re-founded as the Woori Heroes and moved to Mok-dong in Seoul. In 2010, the team's naming rights were sold to Nexen Tire and the team was renamed Nexen Heroes, until the end of the 2018 season, when its naming rights were sold to Kiwoom Securities. Expansion resumed in the 2010s, with the addition of the NC Dinos, located in Changwon, which joined the league in 2013. It is the first team located in Changwon, the city having previously been the second home of the nearby Lotte Giants. In 2015, the KT Wiz became the league's tenth franchise. They play their home games in Suwon, which had not had a team since the Hyundai Unicorns' disbandment. Several KBO players have also successfully transitioned from the KBO to the Major Leagues, such as Ryu Hyun-Jin, Kang Jung-Ho or Kim Hyun-soo. Starting with the 2015 season, each team plays 144 games in the regular season, increased from 128 due to the addition of the KT Wiz to the league. Each team plays every other team 16 times. In mid-July of every season, the best players participate in the KBO All-Star Game. The franchises participating are divided into two sets of teams: Dream All-Stars (Doosan, KT, Lotte, Samsung, and SK) and Nanum All-Stars (Kia, Hanwha, LG, NC and Kiwoom). The KBO All-star game does not determine home-field advantage in the KBO Korean Series. The KBO League's season culminates in its championship series, known as the KBO Korean Series. Currently, the top five teams qualify for the post-season based on win/loss records. The lowest-qualifying teams face off in a step-ladder playoff system, where each winner then faces the next-highest team, culminating in the Korean Series against the top-ranked team. KBO Wild Card Game: 5th place team vs. 4th place team. 4th place advances with one win, 5th place must win twice to advance. Best of five series (reduced from seven games since 2009). Any playoff games ending in an official tie are replayed, thereby raising the possibility of a close series containing more than the scheduled five or seven games. Traditionally, South Korean professional baseball games have a maximum number of extra innings before a game is declared an official tie. The KBO abolished this limit for the 2008 season, however it was reinstated in 2009, with a 12-innings limit imposed during regular season, 15-innings limit for playoff games. The league places a cap on the number of foreign players allowed on club rosters. The foreign player limit is set at three, increased from two players from 2014. All teams use the designated hitter rule. ^ The KBO have implemented dual league in 1999 and 2000. The leagues were named Dream League and Magic League. Locations are listed from north to south. In addition to these ballparks, the Lotte Giants play some games at Ulsan Munsu Baseball Stadium, the Samsung Lions at Pohang Baseball Stadium and the Hanwha Eagles at Cheongju Baseball Stadium. The league has recently enjoyed a surge in popularity, with increased attendance every year. In 2016 season, A new national record of over 8 million attendance figures was set. There was massive increase of 1 million compared with previous season. The record was smashed again in 2017 season with over 8.4 million fans to their games during the regular season. Bears, Twins, Giants and Tigers all attracted over 1 million fans. The average game attendance was above 11,600 fans. This increase in popularity has been accompanied by the building of larger and more modern ballparks to further enhance the fan experience and their expenditures during games, such as Gwangju-Kia Champions Field (2014), Gocheok Sky Dome (2016), Daegu Samsung Lions Park (2016), and Changwon NC Park (2019). ^ "The Korea Baseball Championship is the annual pennant race of first-tier professional baseball league in South Korea." Confirmed by Moon Jung-kyun, Public Relations Manager of Korea Baseball Organization. For further information, refer to the talk page of the Korean version article. ^ "A Cheerleader Helping to Reinvigorate Pro Baseball". english.chosun.com. ^ "Korea and Baseball". koreatimes. 25 March 2009. ^ [2017 결산] 프로야구, 역대 최다 840만 관중..국민스포츠 공고 (in Korean). star.mt.co.kr. December 21, 2017. Retrieved February 12, 2017. ^ Korea Baseball Organization (2015). 2015 달라지는 점 Archived 2015-04-05 at the Wayback Machine (Korean). Accessed on April 14, 2015. ^ Kim Jae-Won (2009-01-13). KBO Abolishes Endless Overtime Rule. The Korea Times. Accessed on 2009-06-11. ^ "Korea pro baseball league KBO breaks nation's attendance record, surpasses 8 million". WBSC. 30 September 2016. Retrieved 9 March 2019. ^ "KBO postseason opens in Korea, following 8.4 million regular-season attendance". WBSC. 7 October 2017. Retrieved 9 March 2019. ^ Category:Korea Baseball Organization Awards. Baseball-Reference.com (Sports Reference LLC). Retrieved 2010-07-02. ^ KBO Most Valuable Player Award. Baseball-Reference.com (Sports Reference LLC). Retrieved 2010-07-02. See also: Chinese Professional Baseball League MVP of the Year Award and Nippon Professional Baseball Most Valuable Player Award. ^ KBO Rookie of the Year. Baseball-Reference.com (Sports Reference LLC). Retrieved 2010-07-02. See also: Chinese Professional Baseball League Rookie of the Year Award and Nippon Professional Baseball Rookie of the Year Award. ^ KBO Gold Gloves. Baseball-Reference.com (Sports Reference LLC). Retrieved 2010-07-02. See also: Nippon Professional Baseball Mitsui Golden Glove Award and Major League Baseball Gold Glove Award. ^ Korean Series Most Valuable Player Award. Baseball-Reference.com (Sports Reference LLC). Retrieved 2010-07-02. See also: Major League Baseball World Series MVP Award. ^ For the KBO League All-Star Game MVP, go to KBO Gold Gloves, scroll to the bottom, and click on All-Star Game MVP. Baseball-Reference.com (Sports Reference LLC). Retrieved 2016-10-13. Wikimedia Commons has media related to KBO League. This page was last edited on 20 March 2019, at 04:06 (UTC).